Neurotransmitters (i.e., biogenic amines and amino acids) are common chemical messengers that promote intersynaptic signal transmission, thereby participating in brain function. Direct knowledge of brain structure and function is critical for understanding and treating brain disorders like addiction, depression and neurodegenerative disease. Until now, researchers relied on two non-ideal strategies to acquire this data: indirect analysis, which is labor-intensive and yields low specificity, and matrix-assisted laser desorption/ionization (MALDI), which can produce isobaric interference—especially for low–molecular weight compounds like neurotransmitters. Research team Fernandes et al. (2016) recently reported on an alternative technique: desorption electrospray ionization mass spectrometry imaging (DESI-MSI).1 They applied DESI-MSI using a high-resolution, high-accuracy mass spectrometer to directly visualize the following neurotransmitters in coronal and sagittal rat brain slices: gamma-aminobutyric acid (GABA), glutamate, aspartate, serine, acetylcholine, dopamine and choline. This technique is matrix-free, simplifying the workflow and eliminating matrix interferences. Here they used a Q Exactive Hybrid Quadrupole-Orbitrap mass spectrometer (Thermo Scientific). 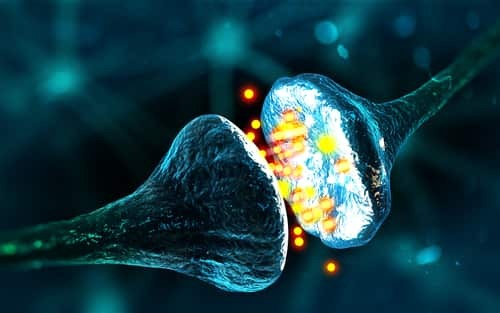 Because of the low abundance of neurotransmitters (especially in comparison with other biomolecules also localized in the brain, like lipids), the researchers described neurotransmitter imaging as akin to searching for a needle in a haystack. They reported their DESI-MSI technique to be ideal for demonstrating how neurotransmitters spatially distribute in rat brain slices, producing clear and well-resolved images. For this functionality, the high-resolution mass spectrometer proved essential. They were able to concomitantly visualize all investigated neurotransmitters in space, using both cerebral and cerebellar brain sections, as well as standards for each analyte. They produced a series of images for each neurotransmitter and noted greater abundance of acetylcholine in cerebral extracts and of glutamate in cerebellar extracts. The authors indicate that DESI-MSI incorporating a high-resolution, high-accuracy mass spectrometer like the Q Exactive Hybrid Quadrupole-Orbitrap mass spectrometer is ideal for spatial screening of neurotransmitters as a component of neuroscience research. They highlight its applicability for cases where the abundance or distribution of neurotransmitters may change or show imbalance, such as in response to disease or as a result of therapeutic intervention. During the writing of this paper, another research team, Bergman et al., also reported absolute quantitation of three neurotransmitters (acetylcholine, GABA and glutamate) in rat brain slices via nano-DESI-MSI.2 Fernandes et al. offered their findings as a corroboration and extension of this research, as they detailed the distribution of those three neurotransmitters plus three more (aspartate, serine and dopamine) and used both coronal and sagittal rat brain slices (compared with only coronal). Together, these findings offer compelling evidence of the suitability of atmospheric pressure ionization techniques for neuroscience applications. 1. Fernandes, A.M., et al. (2016) “Direct visualization of neurotransmitters in rat brain slices by desorption electrospray ionization mass spectrometry imaging (DESI – MS),” Journal of the American Society for Mass Spectrometry, 27(12) (pp. 1944–1951), doi: 10.1007/s13361-016-1475-0. 2. Bergman, H.M., et al. (2016) “Quantitative mass spectrometry imaging of small-molecule neurotransmitters in rat brain tissue sections using nanospray desorption electrospray ionization,” The Analyst, 141(12) (pp. 3686–3695), doi: 10.1039/c5an02620b.